This is a tribute to @FrugalDougal whose charity fund raising efforts for animal causes through #pawpawty events held on Twitter are now legendary. This tribute is in lieu of my attendance at #dudefest, which was held in Dougal's honor. Update December 21, 2012: This week, Dougal crossed the Rainbow Bridge as so many dogs, cats and other animals have before him. A great anipal has fallen. This tribute was written several years ago, while Dougal was with us, but I'm not sure that any tribute can really express what impact he's had. RIP little dog. You are missed. If you're not all that familiar with Twitter, you might not know what a #pawpawty hashtag is, or an anipal, and some of this might seem strange to you. But, a growing number, and I mean a laaaaarge number (like bigger than Dewey the Library Cat's fan club) of cats, dogs, ferrets, rabbits, and, well, you name it are opening accounts on Twitter! "Pair of pawty anipals and owners use Twitter to make money for charities around the world" was the sub-headline for that story on Dougal and @Romeothecat. I'll let you read the rest over there. band Shibbering Cheetos at Dudefest! Who is Frugal Dougal? Well, hopefully by the time you read the poem below, you'll understand a bit more, but I'm actually talking about a dog. I know it might seem odd that I'm writing a poem about a dog, but... he has helped countless cats and other animals as well. By the way, an enormous amount of effort and creativity is put into each of these virtual parties on Twitter, and I don't want to take away from all of the many folks who work so hard, month-in and month-out to raise money for animal causes. But, like the #dudefest, this is a tribute to Frugal Dougal. On that note, below is a poem that I wrote in honor of the great Dougal. I hope you find it entertaining. For the uninitiated, it might give some indication as to why, in world of animal charities, Twitter and anipals, Frugal Dougal is famous. Dougal, you are the best. At raising money for those in need. Master of the Anipal Fest. The #Pawpawty is your game. Helping those with great causes. Assisting those who have pawses. Who don't work, and can't drive. To a great doggy friend. For those who can't speak. Of benefits for the weak. Taken in humble doggy stride. We salute the strides you have made. And honor you with pride. And friends of the Dougal. Be alert and listen up. For there is much to be learned. From this little furry pup. Not through word but through deed. With his actions he drives. Funding for medicine and feed. In the hands of the skilled. That otherwise might be killed. As Tina once sang it. You teach others about living. As we learn by your lead. Adopting a selfless spirit of giving. As our minds become freed. From the bonds we've created. We release our imaginary hold. To embrace the entire fold. Awakened by you, furry teacher. With all that it brings. You've played a huge part. For the spreading of awareness. Of the plight of furred and feathered. Treating lesser creatures with fairness. We throw off the bindings. That shackle and blind us. And prove kindness in fashion. Of hate, and of fear. You make it undoubtedly clear. That the way to the top. Is not a ladder or a fight. The concern for the plight. Of the others we see. From cages we could free. If we were more kindhearted. The fun and the fest. About who is the best. The #Pawpawty is a feast. And the barktenders don't quit. And the animals all benefit. There's bacon beer served cold. The menu fresh and bold. Drinks are at full pour. By volunteers who dress up. In the costume de jour. Disguising kitty cat or pup. But do you have anything for frogs? No offense to the swine. They eat 'em for dessert. And put up blocks and jammers. Bacon beer from the tap. Some of them get naughty. And need a little slap. Some anipals go to jail. And have to be freed. You see much fun is had. But amidst all the pretend. And Dougal is to blame. For it was he who first lit. Now a raging fire pit. If you embrace the habit. Of attending these online shindigs. You might see rodents and rabbits. If I've left creatures out. But if you feel left out. You are the best anipal. You show us the way. Of each wave of donation. As we give high paw. To this amazing little doggy. Of whom we're in awe. For no one does more. For those with four paws. Of your big giant giver. When we're gone from this place. And no one can name us. They'll know Dougal's cute face. 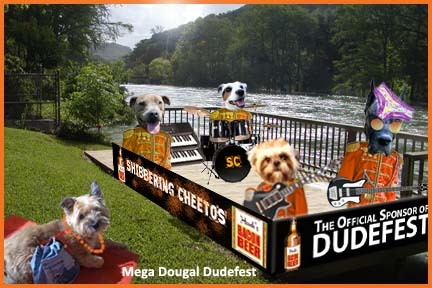 #Dudefest, a #Pawpawty in honor of Dougal, was organized by @brutusthedane. You can view the #Dudefest pawwall put together by @GeorgeTheDuck, and the Dougal celebration blog put together by @PepiSmartDog and @BadAndy_KityKat. You can read more about Romeo the cat and his charity efforts, as well as Frugal Dougal's blog. Feel free to let me have it in the comments! Oh, and you can say nice things about Dougal if you want. Purrs and thank you. P.S. Here's a video that shows some of the history behind animal fundraising on Twitter and the evolution of the #PawPawty. You're welcome, Dougal. I enjoyed writing it. Thank you so much for a great poem mai pal, that must have taken you a long time to come up with all of those words.